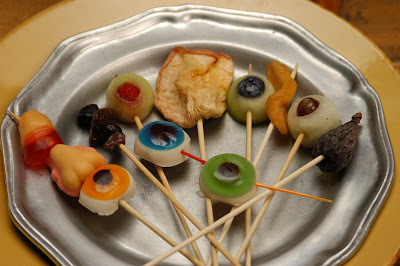 Create creepy and spooky drink garnishes by placing different foods on toothpicks or skewers. Dried fruits are great “organs” – dried strawberries become frog hearts and dried apples become goblins’ tongues – and are readily available at supermarkets. Make “witch toes” by breaking off small pieces of fresh ginger. Slice a bit of the skin off each one to represent a toenail. Attach each toe to the end of a toothpick. Gummy candies come in many different creepy shapes and also work great for this project. Whoa...those are way creepy, I love them! Thanks for the great idea, I'll be linking.